NJ Top Docs is very proud to present Dr. Joseph Savon as a NJ Top Doc for 2017! 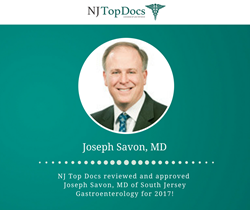 Dr. Joseph Savon was recently reviewed, approved, and awarded the title of being a NJ Top Doc for 2017. Dr. Savon is double board certified in Gastroenterology and Addiction Medicine and has been in practice for twenty-four years. He is part of a top notch GI practice - South Jersey Gastroenterology - that’s been deeply rooted in Southern New Jersey for decades. Dr. Savon’s practice has multiple locations and has a research department in addition to a pathology lab within their facilities. The volume of his patients place him at the top of the nation for endoscopic volume and The Endocenter at Voorhees has a no-deficiency score from AAASC. Dr. Savon received his undergraduate degree at St. Joseph’s University in Philadelphia before receiving his M.D. from UMDNJ- Robert Wood Johnson Medical School. Dr. Savon then completed his Internal Medicine Residency at Thomas Jefferson University and his Gastroenterology Fellowship at Presbyterian Medical Center of Philadelphia. Dr. Joseph Savon is currently affiliated with Virtua Health Systems. To learn more about this NJ Top Doc, please click here: https://njtopdocs.com/nj-doctors/dr-joseph-savon/ .